This PMR study offers an eight-year analysis and forecast on the global industrial cable reels market between 2018 and 2026. The study considers 2017 as the base year with market values estimated for 2018 and a forecast developed for the duration of 2018 to 2026. The Compound Average Growth Rate (CAGR) has been represented from 2018 to 2026. The study covers various perspectives of the industrial cable reels market, including industrial cable reels market dynamics, value chain, pricing analysis, competition analysis, regional and segmental growth comparison and macro-economic and industry growth analysis, along with segment level projections in a comprehensive manner. As per the findings of the study and perspectives of industry participants, the global industrial cable reels market is projected to grow at a CAGR of 4.0% between 2018 and 2026 in terms of value. Better education and awareness, government subsidized schemes for the procurement of manufacturing equipment, the shift from manual labor to mechanization and growing demand are some of the factors expected to lay a robust foundation for the growth of the global industrial cable reels market. This Persistence Market Research report on industrial cable reels carefully analyses the industrial cable reels market at a global and regional level through market segmentation on the basis of key parameters, such as product type, cable core, design, application and region. The primary objective of the industrial cable reels market report is to offer key insights on market updates, competition positioning, current trends, market potential, growth rates and other relevant information and statistics in a suitable manner to the readers or various stakeholders of the industrial cable reels market. Industrial cable reels are equipment designed for cable management. They include three different types – spring loaded industrial cable reels, motorized industrial cable reels and manual industrial cable reels. Industrial cable reels are easy to install and durable and thus, find extensive use in the manufacturing and logistic industry. The report is structured to facilitate the reader to develop a thorough understanding about the industrial cable reels market. It begins with market definitions, followed by market background, market dynamics and market analysis by key segments, regional analysis and competition landscape. Each section covers a qualitative and quantitative assessment of the market on the basis of facts, historical developments and key opinions collected from industry participants through dedicated interviews and trends in the industrial cable reels market. The industrial cable reels market report begins with a market introduction, defining the market taxonomy and providing product definitions regarding the global industrial cable reels market assessment. In the next section, the report describes the industrial cable reels market development background, covering macro-economic factors, industry factors, product life stage and associated stages, forecast factors, regional weighted average pricing analysis, value chain overview covering approximate margins, an indicative list of players involved in each stage and an assessment of the installed base of industrial cable reels for the base year considered for the study. The next section of the report discusses industrial cable reels market dynamics, such as drivers (supply and demand side), restraints, opportunities and trends impacting the market growth at a global level. This section also includes the impact assessment of market dynamics on the global industrial cable reels market at a qualitative level based on analysis facts and insights. Subsequent sections of the report provide value (US$ Mn) and volume (New Sales in Units) projections for the industrial cable reels market on the basis of the aforementioned segments at a global level. The global industrial cable reels market values represented in these sections have been agglomerated by collecting data and information at a regional/country level. The industrial cable reels market information, along with key facts and insights, covers unique analysis frameworks, such as absolute $ opportunity analysis, year-on-year growth trend comparison, market share and attractiveness analysis for each of the sub-types covered in each segment. The next section of the report presents a summarised view of the global industrial cable reels market based on the seven prominent regions considered in the study. The section includes the regional market position, growth potential, trends and market attractiveness analysis for each of these regions. In order to offer an accurate forecast, we started by sizing the current industrial cable reels market, which forms the basis of how the global industrial cable reels market is expected to develop in the future. Given the characteristics of the industrial cable reels market, we triangulated the outcome of three different types of analysis, based on primary research, secondary research and our own analysis. However, forecasting the market in terms of various industrial cable reels market segments and regions is more a matter of quantifying expectations and identifying opportunities rather than rationalising them after the completion of the forecast exercise. In the final section of the report, a competitive landscape of the industrial cable reels market has been included to provide report audiences with a dashboard view categorised on the basis of providers present in the value chain, their presence in the industrial cable reels market and the key differentiating factors and strategies. The primary category of providers covered in the report includes the manufacturers of industrial cable reels. This section is primarily designed to provide clients with an objective and detailed comparative assessment of the key providers specific to a market segment in the value chain of the industrial cable reels market. Report audiences can gain segment-specific vendor insights to identify and evaluate key competitors on the basis of the in-depth assessment of their capabilities and success in the industrial cable reels marketplace. 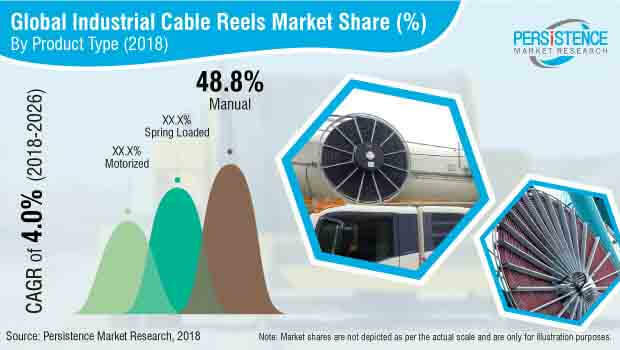 Detailed profiles of the providers have also been included under the scope of the report to evaluate their long- and short-term strategies, key offerings and recent developments in the industrial cable reels market. Examples of some of the key competitors covered in the industrial cable reels report include Delachaux SA, Cavotec SA, Stemmann-Technik GmbH, Paul Vahle GmbH & Co. KG, United Equipment Accessories, Inc., Hubbell Incorporated, Scame Parre S.p.A., Nederman Holding AB, Eaton(cooper industries), Emerson Electric Co., Legrand SA and Schneider-Electric. The report covers comprehensive information about market trends, volume (units) and value (US$ Mn) projections, competition, market dynamics and recent developments in the Global Industrial cable reels Market for the study period 2018 to 2026. The global industrial cable reels market is expected to reach a little over US$ 3,402.6 Mn by the end of the forecast period while registering a CAGR of 4.0% for the period between 2018 and 2026. Investments in public and private sector construction projects are primarily responsible for driving growth in the Industrial cable reels market. Also, the flourishing industrial sector, including manufacturing, mining, construction, utilities and oil and gas, is expected to push the growth of the Industrial cable reels market during the forecast period. Today, almost every sector -- from FMCG to manufacturing and consumer durables -- needs material handling equipment, in which cable reels are used. Government initiatives, such as ‘Make in India’, have made the country an export hub for many Asian countries. Growing population and migration of people to urban areas have led to an increase in demand for infrastructural facilities in cities. Due to the support of the government in the form of loans, increase in FDI, investments and subsidies, construction of commercial spaces is expanding with every passing day. Consequently, a significant increase in urban infrastructural projects is being witnessed, which in turn, will spur the demand for cable reels in many Asian countries. On the basis of product type, industrial cable reels are of three types: spring loaded industrial cable reels, motorized industrial cable reels and manual industrial cable reels. Spring loaded industrial cable reels are expected to gain traction during the forecast period owing to its adoption in the manufacturing sector across the globe. However, in terms of volume, the manual Industrial cable reels will dominate the market of Industrial cable reels owing to growing demand from countries, such as China and India. The manual industrial cable reels segment is estimated to grow at a value CAGR of 4.1% during the forecast period. Amongst all the types of cores analyzed in this global Industrial cable reels market study, the 4 core to 6 core industrial cable reels segment is expected to register about 1.5X growth in terms of value. Growing preference for 4 core to 6 core industrial cable reels, particularly for Industrial and Carne application, is expected to create new growth prospects for Industrial cable reels manufacturers across the globe. In terms of incremental $ opportunity, the 4 core to 6 core industrial cable reels segment is expected to account for 52.2% of the total incremental $ opportunity created between 2018 and 2026. Growing manufacturing, import export and demand for cranes from the North America region are some of the factors expected to drive growth in demand for industrial cable reels in the region. However, in terms of volume, Asia Pacific (SEAP, China and Japan) is estimated to account for nearly one-half of the total Industrial cable reels units sold across the globe by the end of 2018. The units sold in Asia Pacific are majorly less than 4 core Industrial cable reels and they are sold at a lower price than rest of the world and hence, the country lags behind in terms of value share. Rising urbanization is leading to a flourishing construction industry and innovations in manufacturing sector. Regions including North America and Europe are expected to gain traction during the latter half of the forecast period owing to the anticipated replacement of stocks of industrial cable reels in these regions. With growing advancements in the manufacturing sector, Southeast Asia Pacific is also estimated to project higher growth opportunities during the forecast period. In the recent past, the Industrial cable reels market has witnessed significant developments from a competition perspective. New product launches, collaborations and acquisitions are some of the preferred strategies opted by prominent players to expand and sustain in the global Industrial cable reels market. Some of the prominent players covered in this market study on the global industrial cable reels market include DELACHAUX SA, Cavotec SA, STEMMANN-TECHNIK GmbH, Paul Vahle GmbH & Co. KG, United Equipment Accessories, Inc., Hubbell Incorporated, SCAME PARRE S.p.A., Nederman Holding AB, Eaton(cooper industries), Emerson Electric Co., Legrand SA, Schneider-Electric. How has the Industrial cable reels market evolved in the past four years? What are some of the competition developments and trends in the Industrial cable reels market? What are the important market positioning and key strategies of key manufacturers as per the market taxonomy? What are some of the underlying macro-economic and industry factors impacting the growth of the Industrial cable reels market? What shape is the Industrial cable reels market expected to take in terms of volume and value during the study period? What are some of the prevailing market dynamics in the Industrial cable reels market? How is the competition structured at present and how has it evolved in the Industrial cable reels market over the past few years? What are the important key challenges, opportunities and improvement factors for market players?